Forty (ahem) years ago, when I was a fledgling paramedic in working in Phoenix, AZ and later in Florida, the street drug of choice was Heroin, and Naloxone (a narcotic antagonist used for treating opiate overdoses) was one of our most useful meds. Since then, much has changed. Powder Cocaine arrived in the 1980s, and largely supplanted heroin, particularly among upscale users. Crack cocaine was the option on the street. Home brew crystal meth took off in the 1990s, and continues today. Opioids have made a comeback as well, ranging from Rx meds to heroin (see CDC Vital Signs: Heroin Addiction & Overdose), and as we saw last year in Indiana, can produce other public health crises (see CDC HAN Advisory & MMWR: HIV & HCV Among Injectable Drug Users). Incredibly bad stuff, all. But in recent years another drug has emerged, one that plays on people’s perception that marijuana is relatively harmless (and indeed, legal in some states); and since it's advertised as `herbal', it must be safe: synthetic pot. Cheap, and often readily available – usually sold as "herbal incense" or sometimes as "herbal smoking blends" with names like `Spice’, `K2’, or `Aroma’ – these synthetics have a growing reputation among ER doctors, and mental health professionals, as extremely dangerous drugs. Those who work in the mental health units are seeing an alarming increase in admissions related to `spice'. In addition, ingestion of `spice’ can induce serious – sometimes lethal – physical reactions that include tachycardia, cardiac arrhythmias, chest pain, nausea, vomiting, and even heart attacks and strokes. At the end of March the CDC will hold a COCA Call for clinicians on the growing use of this dangerous drug. 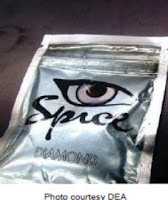 Synthetic cannabinoids are an emerging class of recreational drugs of abuse. Often sold as “spice,” “herbal incense,” or “potpourri,” synthetic cannabinoid chemicals are smoked for their anticipated marijuana-like effects. Since the first reports of trafficking in the United States in 2008, there have been a growing number of reports of related adverse events, including outbreaks of severe illnesses and death. During this COCA Call, clinicians will learn about synthetic cannabinoids, their clinical effects, and the role clinicians can play in the public health response. Discuss recent clusters of severe disease associated with synthetic cannabinoid use in the U.S.